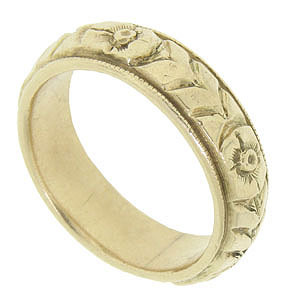 This vintage 14K yellow gold estate wedding band features a distinctive floral design that promises a lifetime of beauty. Large, deeply impressed blossoms interspersed with leaves cover the face of the wedding ring. The outer edges of the band are wrapped in delicate milgrain decoration. The ring measures 5.41 mm in width. Circa: 1950. Size 5 3/4. Can be slightly resized.